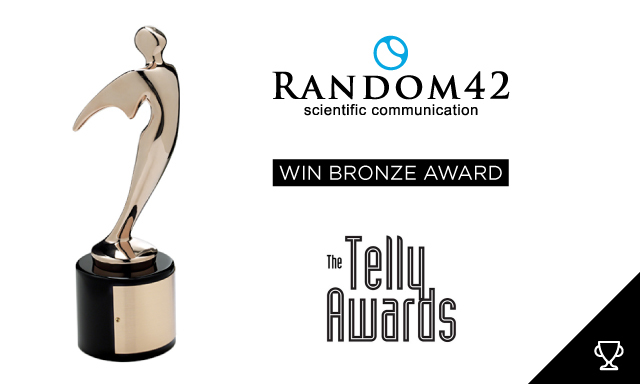 Random42 Scientific Communication have been Honoured with a Bronze Award at the 38th Annual Telly Awards! For nearly four decades the Telly Statuette has been a symbol of creative excellence. This year Random42 have been recognised for their work in Medical Animation. The Telly Awards were founded in 1979 to honour excellence in Film and Video Production. These awards are now one of the most sought-after for industry leaders, from large international firms to local production companies and agencies. The Telly Awards receive over 13,000 entries yearly from all 50 states and 5 continents. Random42 have a very successful track record with the Telly Awards, having been presented with 16 awards since 2009. To learn more about the 2017 Telly Awards please visit the Telly Awards Website.